Smith Falls is pretty well hidden from most travelers. It is located in a very sparsely populated section of North Central Nebraska, far away from any heavily traveled interstate highway. It is also in a section of the country where few would expect to see a magnificent waterfall like this one. Unless you are one of Valentine, Nebraska’s 2,820 residents, getting there is a long drive on empty roads, that even requires four miles on a gravel road off of State Highway 12. Being so far out of the way of where people live and travel, the Niobrara Canyon, where Smith Falls is located, is quite secluded. The river itself looks nothing like the surrounding areas. The dense tree coverage feels reminiscent of places further East. It feels like the perfect destination for a private group experience; a float trip, family reunion, or some other group bonding experience. There does tend to be a few more people at the Falls themselves, as it is the main attraction at the State Park. Unlike some trails, visitors can freely walk right into Smith Falls without breaking any kind of rule. Many visitors bring swimsuits, and wear water shoes, as the trail to get from the parking to the falls is not vigorous at all, although it is about half a mile. Carhenge, just north of Alliance, Nebraska, several hours west of Smith Falls is also quite far from any metropolitan area or heavily traveled highway. This image of an open two-lane highway with nobody else on it, wide open skies and small subtle sand hills in the background sums up the entire three hour drive between Smith Falls and Carhenge. While both attractions are out of the way, a few miles outside a small town (Alliance has a population closer to 8,000), in a way they could not be any more different. Smith Falls and the Niobrara Canyon is all about natural beauty, an attraction carved out of a glaciation event that occurred about 17,000 years ago. Carhenge is a homage to all things manmade, a recreation of Stonehenge, a mysterious pre-historic manmade structure, using a more modern human invention, cars. Whereas Smith Falls is serious, Carhenge is has a goofy vibe. There is also more to Carhenge than just rusty old cars arranged like Stonehenge. This one vehicle apparently has a time capsule in it. In the year 2053, someone will open up memories of 2003, the last year before social media. That should be an interesting experience, especially for someone not old enough to remember such a world. There is also a car where people can write on. A few of these random structures that are made out of car parts, whose relation to the rest of the exhibit is not aparent. And, a car hood with a vaguely political sounding message on it. Not too far from Carhenge is an attraction of both natural beauty and historical significance: Chimney Rock. Although this structure served as a landmark for Native Americans and fur trappers, its significance was heightened when South Pass (in Western Wyoming) was discovered to be the easiest passage across the Rocky Mountains. This lead to most major trails, including the famed Oregon Trail, being routed along the North Platte River, passing by Chimney Rock. Chimney Rock is a National Historical Site with a museum containing artifacts, primarily about the pioneers who traveled this route, including journals and letters written by those who made the journey. It is hard to appreciate in the current era, where anyone with means can get on a plane and fly to some of the most beautiful places on Earth, but when pioneers in the mid-19th Century came across Chimney Rock, they were often in awe of its beauty. Many accounts went to great lengths to describe the structure that is Chimney Rock. It was also recognized by those making the journey at the time as the point where the flat portion of the journey ended and the uphill part began. The journey ahead would become more rigorous, but also more beautiful. Nebraska is not always known as a place with a lot of natural beauty. However, it is not without its places to be appreciated. The truth is that beauty can be found pretty much anywhere, because, it is often not a specific place or a specific person. It is often an experience. A major part of the travel experience is driving. 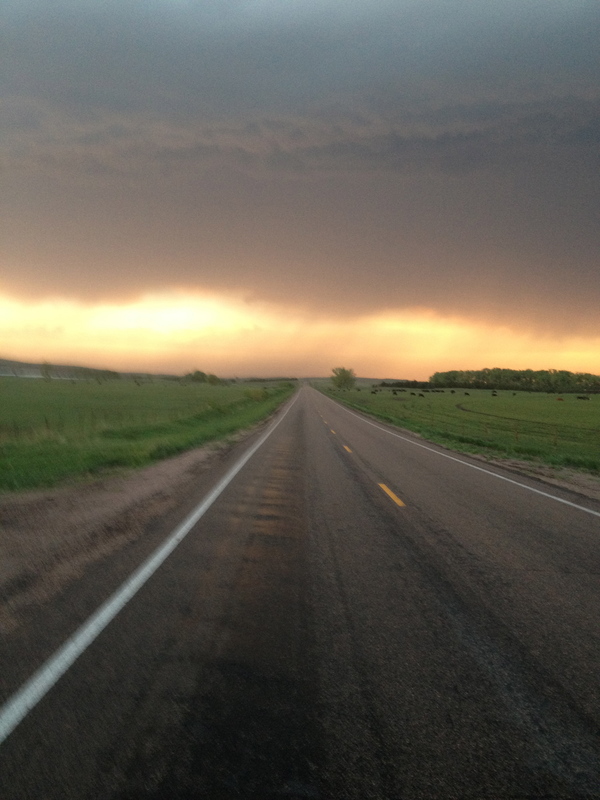 Nebraska offers open roads that pass by subtle features like the sand hills or the rock features further west. The key is to go a little bit out of the way, and to notice, be looking for what is around you. Then, with the right music on in the right vehicle (I personally found both classic rock and EDM to match this situation, you may find something different), the experience becomes a thing of beauty itself. 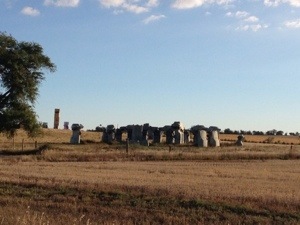 This entry was posted in geography, Historical Locations, history, Museums, Nebraska, Road Trips, trails, trip Recap, Unique Natural Features, Unique Rock Formations, Waterfalls and tagged Carhenge, Chimney Rock, Nebraska, Road Trip, Smith Falls, travel on October 1, 2018 by Stephen Jaye. A few weeks ago, I had the opportunity to visit an Indian Reservation for the first time in my life. I learned quite a bit from that visit. I learned that these reservations do not look like many of us imagine them to. I also concluded that our history is complicated. I do not have a good understanding regarding why relations between us and the Native Americans progressed the way they did, and it would be disingenuous for me to take a position on these issues. However, I did see people in need due to their circumstances. There are some things universal about helping out those in need. Contrary to some people’s belief, helping out those in need is not dependent on ideology, wealth, or status. It is only loosely dependent on what someone believes about the person (or people) they are helping. Caring parents will often bail out their children with financial or housing support even if they believe their child had been lazy, stupid, or malicious in the behavior that led them into trouble. In my belief, in order to be genuine in helping someone out, there are two necessary conditions. There must not be coercion. This one is obvious, being forced to help someone out, or forcing somebody else to help someone out is not genuine charity. There must be no expectation of a reward. This includes not only a monetary reward, but also the guy who does charity work and then starts telling girls at the bar about it to help him get lucky. Or, likewise, anyone that hopes for any praise or increase in status from their charity work. To be fair, rewards can come. But they have to not be the reason for it. For this reason, I was hesitant about writing about this in my blog. It could come across that I am trying to show off that I did charity work. 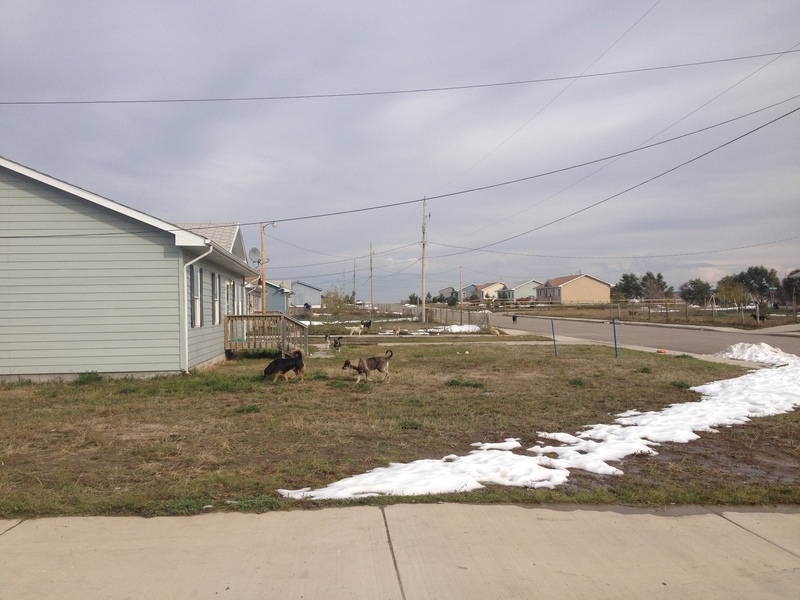 I am really just trying to explain the reason I went back to the Pine Ridge Indian Reservation, as it is one of the poorest places in the country. But, you have no real way of knowing that for sure. Maybe I could have left this whole part out. The Pine Ridge Indian Reservation is in Southwestern South Dakota, with it’s southern border being the Nebraska/South Dakota border. So, as soon as we entered South Dakota, we were on the reservation. Last week, this area got an unexpected early season blizzard. In the Black Hills, to the north, some places got over 40″ of snow. This is something that rarely ever occurs in mid-winter in this part of the country, let alone in early October. Pine Ridge, more on the southern flank of this storm, got about 12″, still a lot, and the evidence of this snowstorm could still be seen. 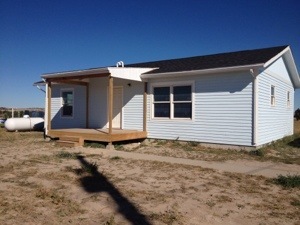 The task yesterday was tiling, and we put up tiling like the one pictured above at a couple of houses in this neighborhood in Pine Ridge. So, just like the day before, I learned a new activity. 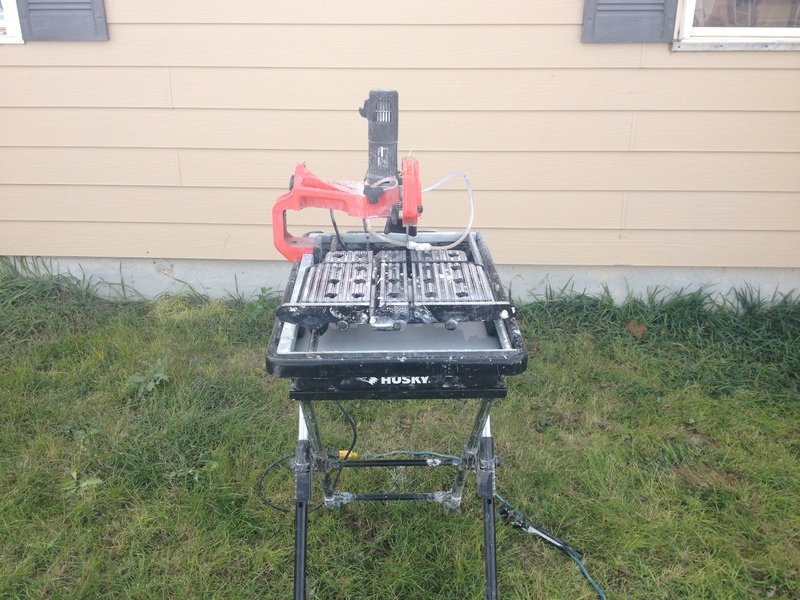 In fact, I continued on the theme of expanding my comfort zone, as over the course of the day I became comfortable using machinery that initially intimidated me. Spending an entire day on the reservation, I made a couple of observations I hadn’t last time (when I was only there for the morning). Last time I felt that the reservation may have just as poor as some of the dispirited urban neighborhoods I had previously observed, but not as dangerous. However, I was only there for the morning, which tends to be the least dangerous time of day. 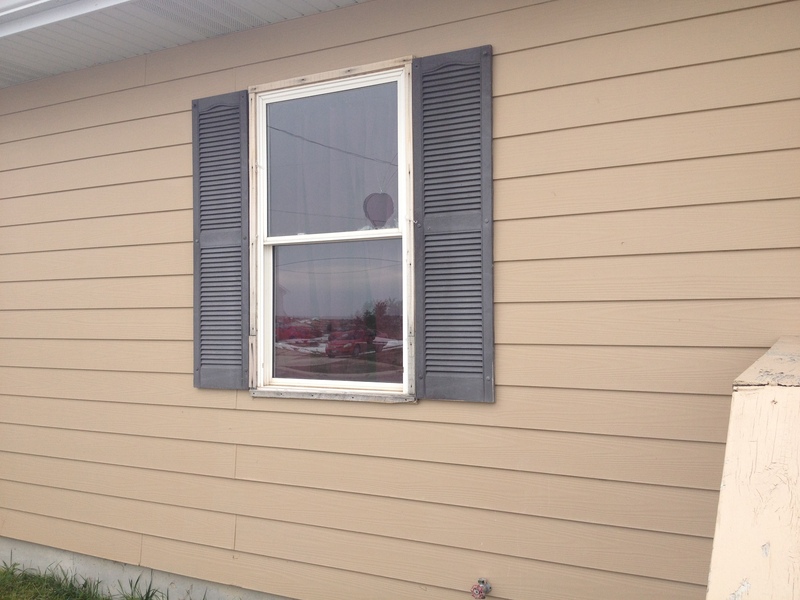 I noticed this hole in the window of one of the homes I helped work on. This hole in the window may just be more evidence that the area is poor and do not have the resources to repair such a thing. Still, I wonder who it got there. Stray bullets from gang related activity tends to be one of the biggest fears one has about visiting poor neighborhoods in the United States. 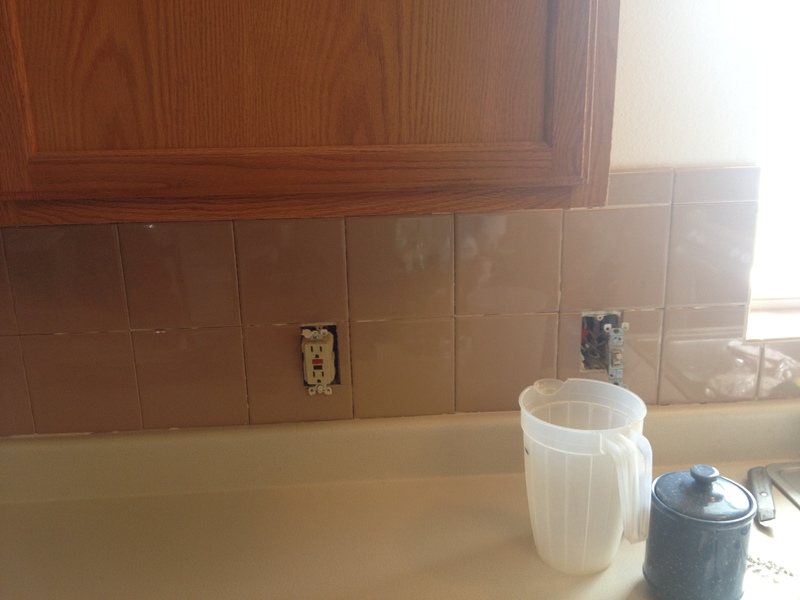 Either way, I am not about to go ask the homeowner how this happened- that would be rude. I was also quite astonished by the number of stray dogs in the neighborhood. 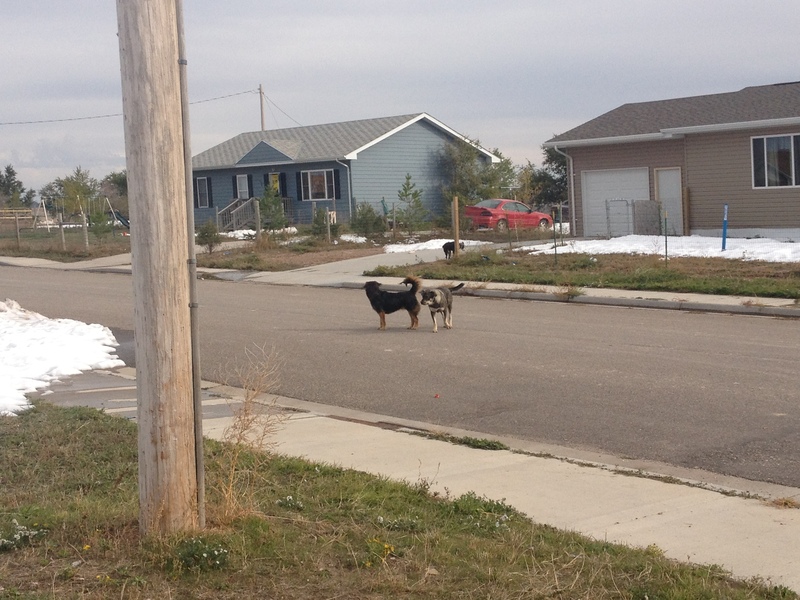 All day long, I encountered stray dogs just wandering up and down the street. I recall one of my former co-workers in Chicago telling me that stray dogs were common on the south side, but I have no idea what that meant. Occasionally I would see a stray dog in my neighborhood, but usually there was someone there to call animal control, or try to find them a shelter. Here they were everywhere, wandering in and out of people’s yards, sometimes getting into people’s trash, and even pooping in the yard (which I was lucky to avoid). I guess I just wonder why there is a different attitude towards dogs here than what I am used to. 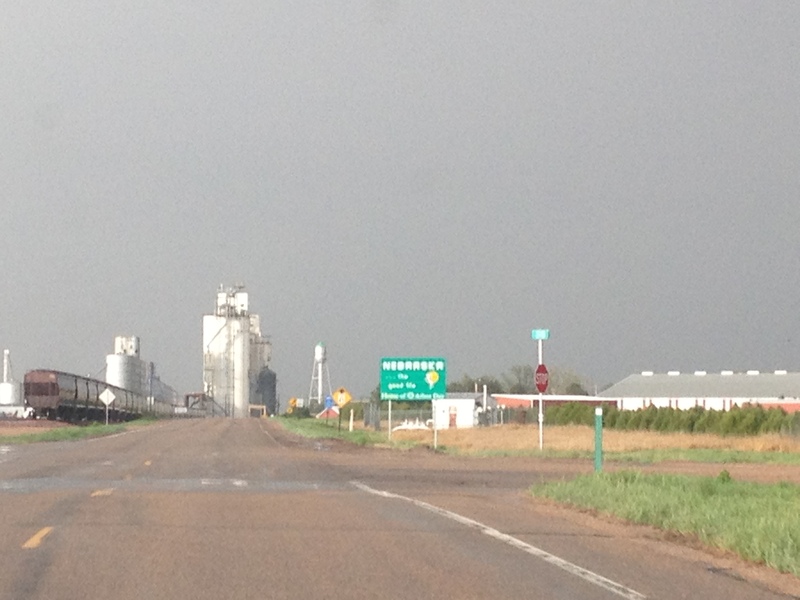 The return trip also gave me an unexpected surprise; the quintessential Nebraska experience. For me, this means thunderstorms and steak. On the return trip southbound across the Nebraska Panhandle, we encountered a series of really fun storms, with lots of lightning. Thunderstorms are my favorite type of weather, at least from an observers point of view. There really is nothing like the raw, natural power of these storms. I also love the differentiation within the storms, and how abruptly things change inside a thunderstorm. With the heavy rain, frequent lightning, hail, and abrupt wind changes, there is so much to see. There is so much going on I feel like I can make a diagram like those Xs and Os the football commentators make. It is the weather phenomenon for people who love to see all things energetic. It is also the weather phenomenon for people who love efficiency. Seattle and Kansas City average about the same amount of annual precipitation (37-38″). However, in Seattle, precipitation occurs 155 days per year, while in Kansas City, precipitation only occurs 104 days per year. Kansas City achieves the same result with 41 more rain-free days. In addition, many days with thunderstorms are mostly sunny for large sections of the day, with the exception of the hour or two when the storms are rolling through. Overall, many more productive hours. 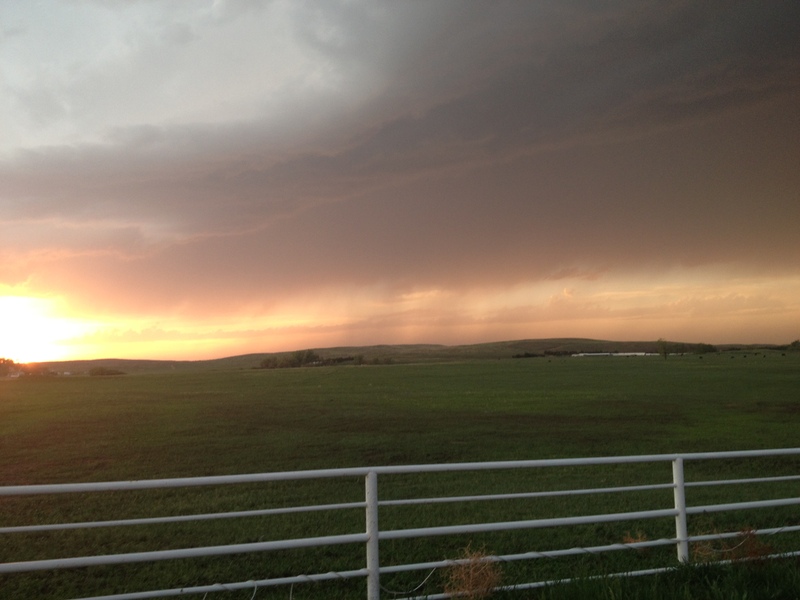 For me, it is the long, humid day, followed by the abrupt thunderstorm that makes the Great Plains what it is. We stopped at a steakhouse called Cantu’s in the town of Bridgeport, NE right after we finished rolling through the storms. The place is right on highway 385, the main street through the center of town. I have many times stopped at random places I encounter on the main streets of towns while driving through. I really like doing this because it gives me a sense of what makes that town unique to every other town I have ever been to, something I won’t get by eating at a chain restaurant. Of course, I have had a variety of experiences, ranging from great to horrible at restaurants like this. However, when on the Great Plains, particularly in areas near a lot of ranches, I’ve have mostly good experiences with steakhouses. The trend definitely continued today. I really enjoyed my sirloin steak at Cantu’s. This entry was posted in Indian Reservations, Nebraska, Road Trips, Scientific Phenomenon, South Dakota and tagged Bridgeport, charity, Indian Reservations, Nebraska, Pine Ridge, South Dakota, stray dogs, thunderstorms, tiling, travel on October 11, 2013 by Stephen Jaye. In some of my travels earlier this year, I was exposed to more of the history of the American West; particularly our series of battles and treaties with the Native American population. Earlier this week, as I gazed towards the east, towards the Great Plains, I pondered people that society often overlooks. Quite possibly the most overlooked people in our society today are the Native Americans. In that vein, I took advantage of an opportunity I got to visit the Pine Ridge Indian Reservation in Southwestern South Dakota. This is one of the poorest places anyone can find within the United States, and a place where a lot of people in the West go to do charity work. The drive up to the Pine Ridge Indian Reservation is primarily through the Nebraska panhandle, through an area I am mainly familiar with through storm chasing. With a little bit of extra time, we got a chance to visit a couple of roadside attractions near Alliance, NE. The primary attraction there is a place called Carhenge. Carhenge is a replication of Stonehenge with old cars that was built by some rancher a couple of decades ago. Apparently, ranchers have nothing to do in the winter, and often end up bored. 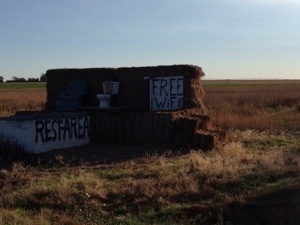 So, from time to time, they come up with something creative, which explains why we also saw this roadside attraction, only a couple of miles further up the road. As we travel north and approach the border of South Dakota, the empty and largely flat land typically associated with Western Nebraska gives way to some rolling hills and pine trees. This first begins to appear near the Niobrara River Valley, a river that actually produces some of Nebraska’s most interesting scenery. In fact, farther down this river, just east of Valentine, NE, is a place called Smith Falls, a waterfall with a 75 foot drop, which is really not to shabby at all. On the road we came in on, Nebraska highway 78, we enter the Indian Reservation as soon as we cross the border into South Dakota. On the border, there is a town called Whiteclay, NE, where Native Americans largely go to buy liquor, as for some strange reason it can’t be sold on the reservation. 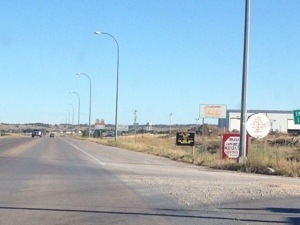 The town of Pine Ridge, the main town on the reservation is a mere couple of miles into the reservation. There, I met the people who assist with coordinating the volunteer efforts of those looking to help. They have an office, which looks like a small house from the outside. Inside, I see a map showing the poorest counties in the United States, a good amount of Native American artwork, and a calendar, with plenty of appointments for people to visit and help written on it. Out of respect, I took a limited amount of pictures on the Reservation. 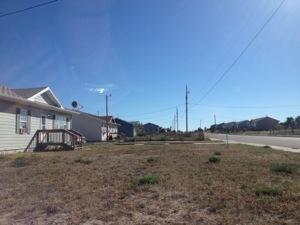 However, I did take a couple of pictures, one of one of the houses we were working on, and one of the neighborhood. At some point, I was under the impression that Indian Reservations are places where people still live in tepees and chase buffalo off of cliffs. But, in reality, they live in towns much like how the rest of us do. We always kind of romanticize the idea of Native Americans as nomads who hunt and gather their food, but history does show that is not always the reality. Particularly in the Southwest, ruins of villages from long before any European Explorer arrived can be found in places like Taos Pueblo and Mesa Verde National Park. The town did look obviously poor. Many of the yards had broken cars and many of the homes were in disrepair. In that sense, it kind of reminded me of some of the poorer parts of Chicago that I had seen, on the West and South sides. I did definitely feel a lot less danger in being there than I had when I had ventured to those parts of Chicago. I guess I did not feel as if I was liable to get jumped, or be hit by a stray drive-by. However, the level of poverty did not feel any less. 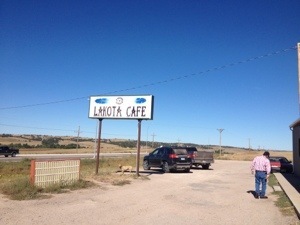 After working on a few homes, we got to go to lunch with a couple of the people who coordinate the volunteer effort, at a place called the Lakota Cafe. I got a chance to have a small discussion with a couple of the people who coordinate the volunteer efforts, and also have some involvement with Indian affairs (with the U.S. Government). I have a ton of questions I would have liked to ask them. I really do not understand everything about our relations with the Native American tribes, as it is a topic that is not commonly discussed in depth. These reservations are sort-of another nation, but also sort of not. Apparently there are a lot of legal controversies in situations where our federal law is different than the laws enacted by the tribes. There are also controversies over water rights, particularly for water from the Missouri River. The water rights controversies in some ways remind me of the ones along other rivers, with those downstream accusing those upstream of taking too much. However, there is definitely a component of it that relates to the treaties we had formed with the tribes (some of which we blatantly violated). Apparently, one of the treaties permits some of the tribes to take the water from the Missouri River in South Dakota. The biggest mystery to me about our affairs with the Native Americans is why we cannot simply just live together like we do, more or less with other racial groups. I mean, we do self-segregate, but we live under the same governmental and societal structure. And this is with different groups of people with differing histories, including some that did not come here willingly. Of course, the history with the Native Americans is also unique, as they were here long before Columbus introduced the continent to the Europeans. Seeing that the reservation has houses, cars, roads, stores, etc. just like us makes it even more of a mystery to me, as the idea of a place where people still chase the buffalo would definitely not vibe with our modern day American culture, but they seemed to have opted to live in towns now. As much as I would really like to know their perspective on this, I decided it was not my place to ask them these questions. It could have been taken the wrong way, as there are a lot of people who feel like the Native American tribes should not have their reservations, and have become a drain on society. They don’t know me, and do not know my intentions, or how I feel about anything. Nor do I really know how I feel about all of this stuff. The more I hear them describe how the law operates within the confines of the reservation, how they coordinate with Badlands National Park and such, the more confused I get. It is the point of view of the Native Americans that their land was taken away from them, little by little, and that in a large part their culture was taken away from them. However, nearly all of the world was once nomadic hunter-gatherers. One by one, different places took to living in cities, agriculture and the like. So, can the Native American tribes be expected to do so as well? It seems like there are towns in the reservations, so I get the impression that the issue is not even necessarily about the idea of nomadically chasing the buffalo. From my visits to places like Crazyhorse, and Fort Larmaie, it does seem like we made a lot of treaties, and broke them. But I don’t know the reason why. Nor do I have anything near a good understanding of that history. I was born nearly a whole century after the last “Indian War” happened. I did not chose to come to a new continent, nor did I chose how we relate with the Native Americans. The only other time in my life I even encountered Native Americans was in Wisconsin in 2004, when we were protesting a professor by the name of Ward Churchill for making outlandish claims about the victims of 9/11. The Natives stood alongside us, as they felt Professor Churchill, only something like 1/16 Native American was stealing their identity to make a political point. So, while it is natural for me to feel that we did historically treat these Native Americans well, I also wonder how much I can personally be expected to feel responsible for something that was done by people who only really have one thing in common with me; their race? In the end, the conclusion I came to today is that I am in no place to take a position on any of these issues, as I simply don’t understand them. I have become tired of people taking strong, decisive political opinions, often deriding those who disagree with them, based on incomplete understandings of facts and history. I believe that people should at least understand the uncertainty around their points of view before they start saying things that could potentially upset others. At this point in time, I am applying the same standard to myself with regards to this particular issue. To take either side, even if I were to take the side of the Native Americans due to what appears to be a failure on our part to honor the treaties, at this point in time would be disingenuous. And, I believe that the Native Americans would think this to be so even if I did take their side with what little knowledge I have of the true history, and the true reasons why thins are the way they are at this present point in time. All I can do is listen, to all points of views, learn more, and be willing to help out those in need. This entry was posted in Indian Reservations, Nebraska, South Dakota and tagged Carhenge, Indian Reservations, Nebraska, Oglalla Tribe, Pine Ridge, South Dakota on September 21, 2013 by Stephen Jaye. I promise anyone that is reading this that this blog is going to have a good deal of variety. I have a good deal of travel plans starting next week, in which I will be traveling almost non-stop the first half of June. 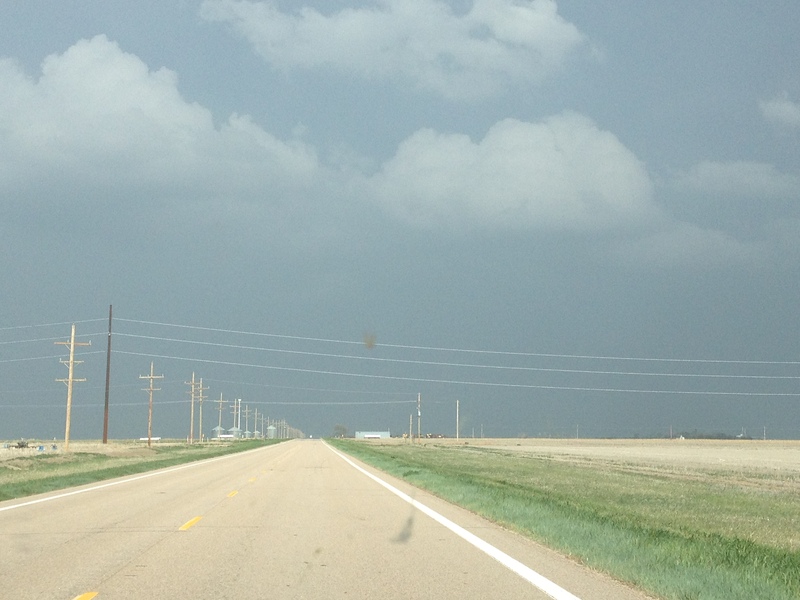 But, for now, I guess there are going to be two consecutive blogs about storm chasing. It is May, the peak month for tornadoes, and I plan to blog about the interesting places that I go. It just so happened to be that two back to back entries ended up being storm chases. I mean, I am not going to blog about things that are not too interesting, like my dog chewing up my underwear yesterday. I guess I could write about partying, but for now I am keeping this a travel blog. This is my first season of chasing out of Denver, so I am still getting used to certain things about chasing from here rather than Chicago. Storm chasing from Denver means that you will always be going east to try to catch the storms, and trying to catch them from behind. This is the opposite of chasing from Chicago which almost always entailed going west. Strong thunderstorms often form on a weather feature known as a dry line. Dry lines are boundaries between dry and moist air, with moist air to the east and dry air to the west. 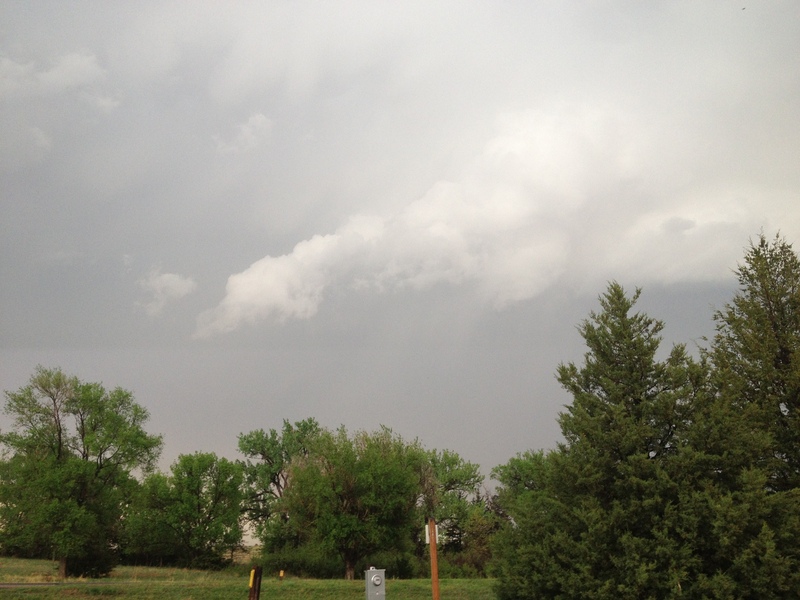 It took us a couple of hours to get to the moist side of the dry line (which is more favorable for storms), but when we first started to see storms form, we were still in a very dry air mass near Akron, Colorado. 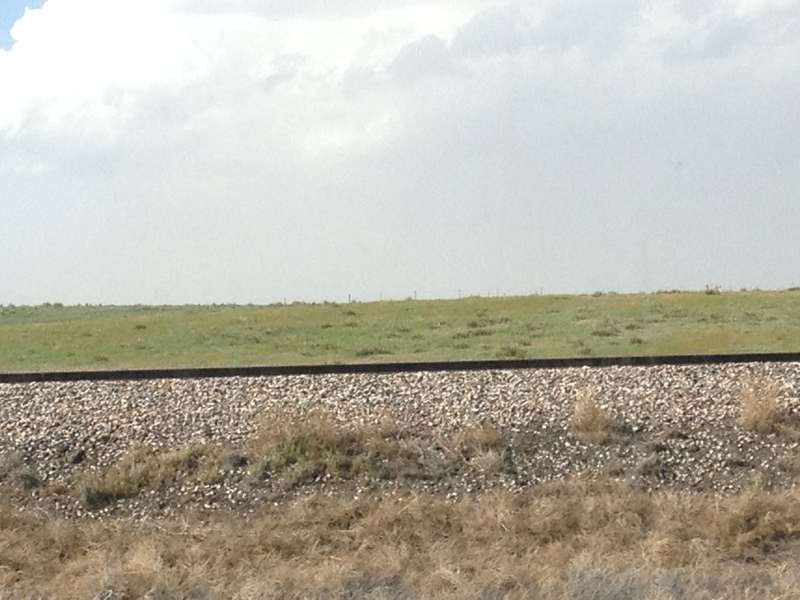 From now on, I am going to refer to U.S. highway 34 from Greeley to the Nebraska state line as “feed lot highway”. I didn’t take another picture of the feedlots because one picture is enough, but I am still amazed by how may cows you encounter along this road in eastern Colorado. I noticed that there is a gigantic feedlot about four miles west of the town of Wray, Colorado. 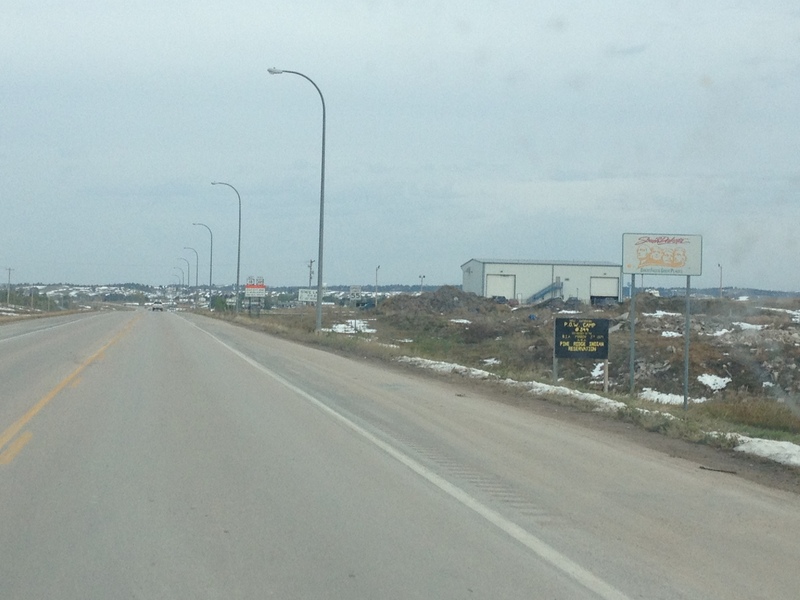 If there is a west wind, that town must smell horrible, and all 100 or so people must be pissed off. There was a part of the drive when we were unable to get the smell of 1000s of cows all jammed up into something like 5 acres of land out of the car. 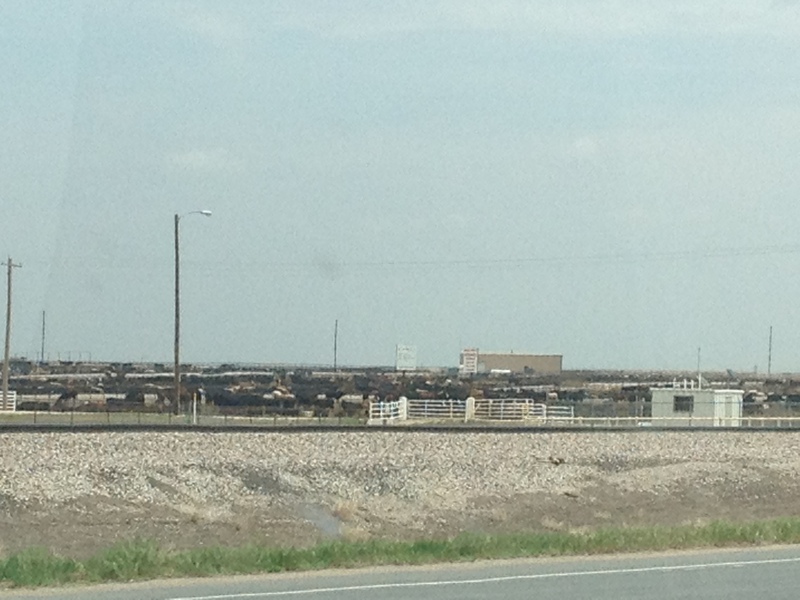 I remember the first time I drove by a feedlot (also on a storm chase). I remember thinking that I had finally encountered a worse smelling road than the New Jersey Turnpike, and it only took me 19 years! We chased four storms today. 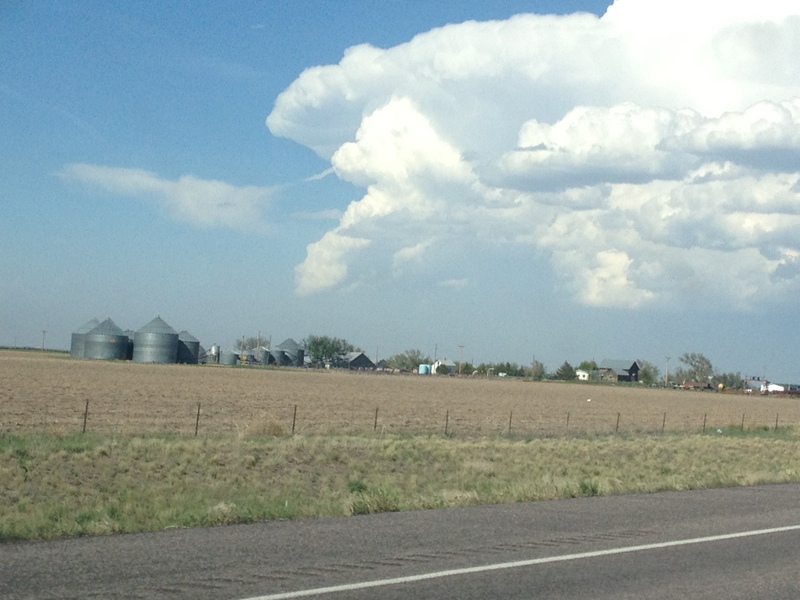 The first two we caught up to near Holyoke, CO, about 35 miles north of Wray. The first storm we caught actually showed some rotation, and produced some major hail. I looked it up later, and the reports we saw indicated hail sizes of up to 2.75″. 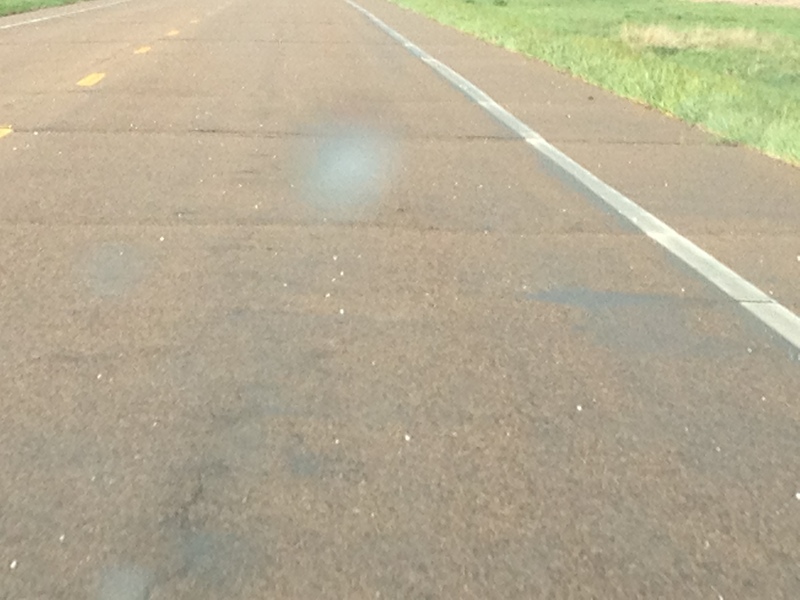 Luckily for our chasing vehicle, we did not end up in that section of the storm, but we did see some smaller hail, as seen on the road in the below picture. We followed the first storm for a while, and then started following the storm just to the east of it. 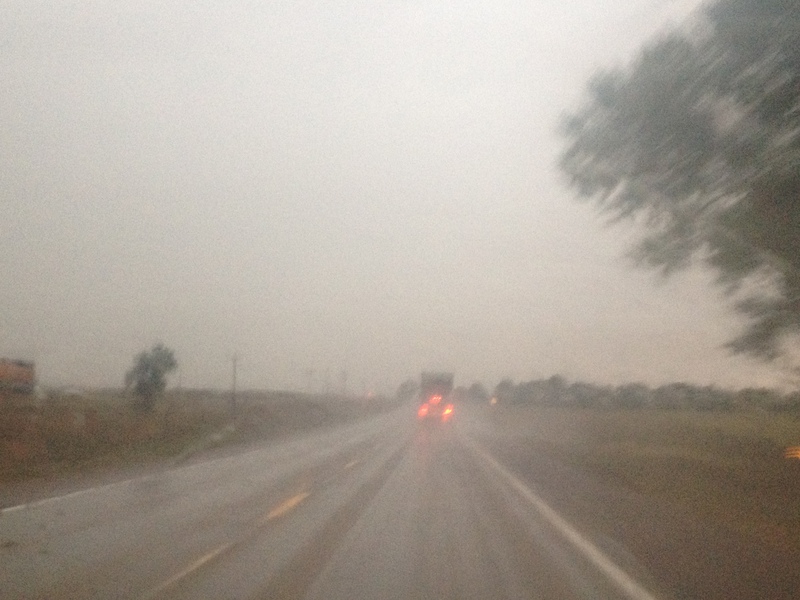 Tracking this storm took us across the stateline into Nebraska. 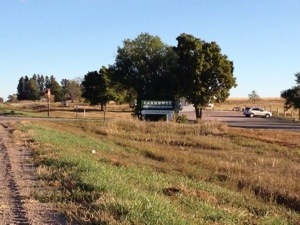 This is the best picture I could get of the welcome to Nebraska sign on state route 23. One of the strange things that makes me happy is when a state highway crosses into another state and maintains the same number in the adjacent state. This is actually somewhat rare. For example, Indiana state highway 2 becomes Illinois state highway 17 when you cross the border. If you look at state highways on a map, you will see that it is way more common for them to take on a different number when crossing a border. But, this crossing was an exception, Colorado state highway 23 became Nebraska state highway 23! By the way, when it comes to state welcome signs, Nebraska is without a doubt blown away by all of it’s neighbors. South Dakota’s welcome sign has an image of Mount Rushmore. Kansas’s has a sunflower. Colorado’s is the classic wooden sign saying “Welcome to Colorful Colorado”. Wyoming’s forever west ones are a neat depiction of the state’s cowboy heritage. Iowa’s say “Fields of Opportunities”. Okay, that is kind of a stupid slogan, but at least it is memorable. Home of Arbor Day? Really, Nebraska? Of all the facts about your state that you could present to me every time I enter Nebraska, you chose Arbor Day? I’d rather see a picture of Warren Buffet every time I enter the state. 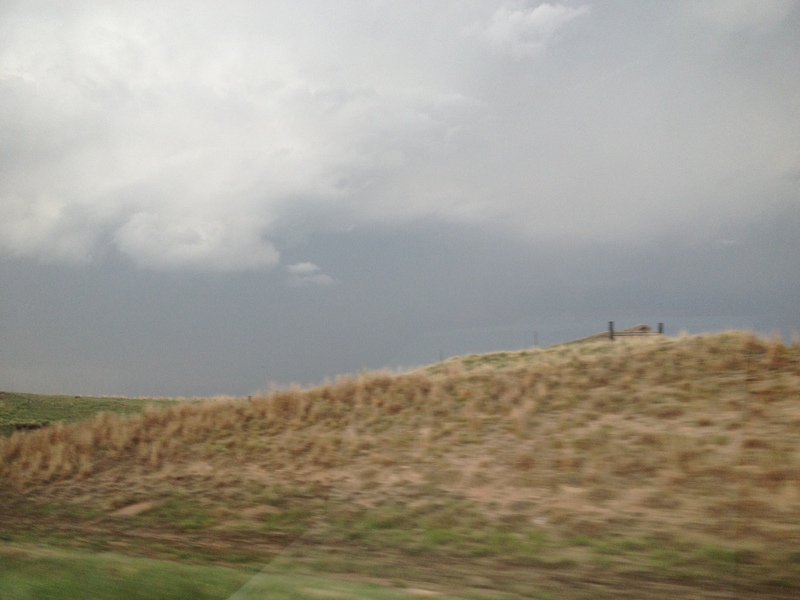 Anyways, that storm kind of crapped out, so we went after a few storms a bit farther north, near Ogallala. Here we actually saw a funnel cloud. It did not reach the ground and therefore was not a tornado. 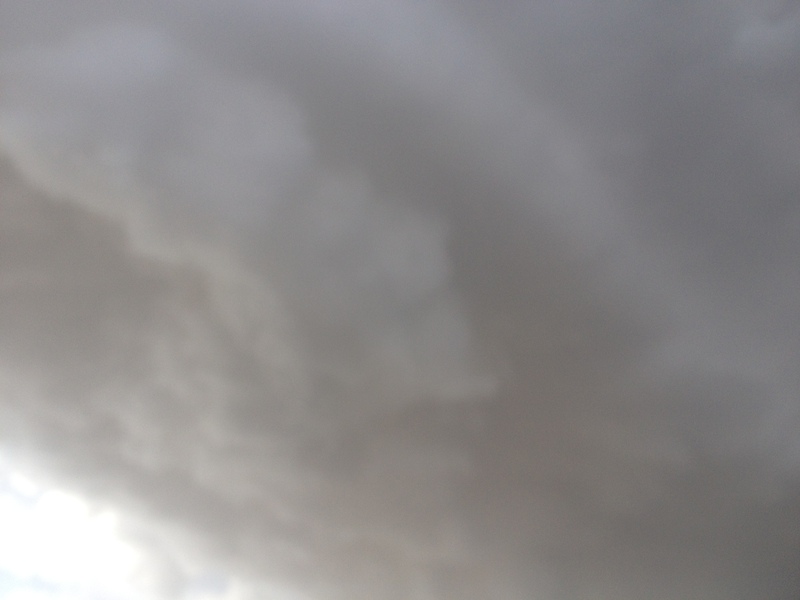 In fact, there were no tornadoes reported today, only large hail and strong winds. So, seeing this, we did feel like bad-asses for being on the best storm of the day even if it was not a tornado. 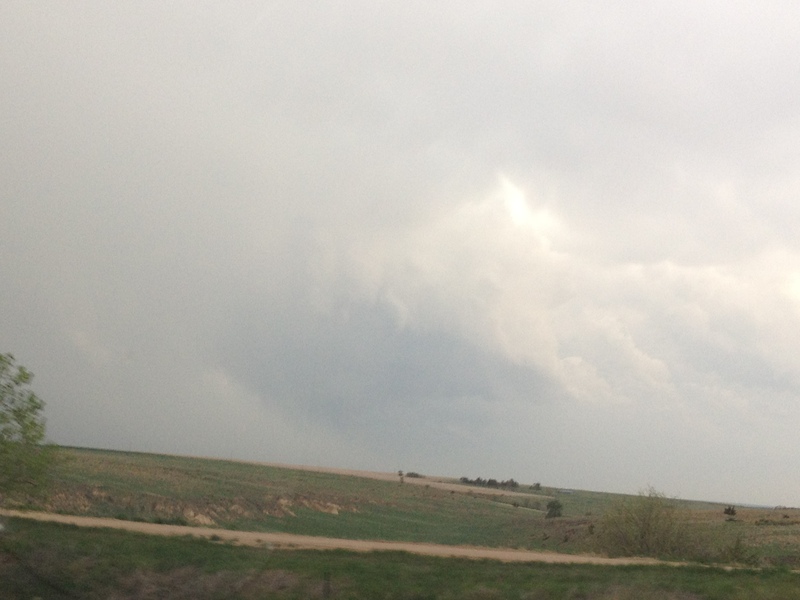 These pictures came north of Ogallala, near Lake Mcconaughy. Basically, somewhere along the line someone decided to dam up the North Platter River just northeast of Ogallala, NE. Behind it, as is typically the case with dams, a lake was created and suddenly Nebraskans had a place to bring their boats. This is not too interesting of a story, but I am sure it is more interesting than Arbor Day. The other problem we ran into was lack of a good road network in the area north and east of Ogallala. Therefore, we had to let this particular storm, which was the most interesting one we saw today, go. Luckily, there was one other storm behind it, tracking northeast from the west edge of Lake Mcconaghy. So, we decided to watch this storm go by- well until sunset. At this ranch, where there were hundreds of cows out on the range, making plenty of noise (it was really funny actually), this spectacular sunset took place. There was something kind of awe inspiring about the way the sun set gradually just to the left of a major thunderstorm that was producing frequent lightning. It’s the kind of event that you really have to be there to truly appreciate, but let’s just say it was one of those things that really got me thinking. I tried to get a picture of lightning, but it is hard to do so with a cell phone camera. But, I really liked the feeling of being on an empty two lane undivided road looking straight into a thunderstorm around sunset. I think it just had a specific feeling to it. It’s kind of like stepping into the unknown, and taking a path less traveled, but still knowing you are not going anywhere too terribly dangerous. It is stepping far enough outside your comfort zone to generate an excitement in you, but not so far that you get truly scared, kind of like trying a new restaurant or taking a new class. This scene also reminded me of a time in my life when roughly half of my weekends would start out this way; traveling on the open road on a Friday evening. This was in college and graduate school when I would frequently be headed elsewhere in the general Midwest area; Chicago, Madison, Minneapolis, Indianapolis, Ann Arbor, Saint Louis, Bloomington, Champaign, etc. I remember months where I would literally have spent 24 total hours traveling, but realize that I had not even left the corn belt. Most of those weekends actually ended up being somewhat similar. They would involve parties (or bars, etc.) with a couple of people I knew, and a bunch of people I did not know. It was exactly that mix of the familiar and the unknown that is captured by driving down a desolate road into a thunderstorm. In a way, it is the balance we are all seeking. Very few people are satisfied continuing to do the same thing over and over again for their entire lifespan. So, we all must learn new things, meet new people, and develop new experiences. But, we must all do so at our own pace. As I watched the sun slowly descend the horizon I continued to ponder what it meant. I thought to the feelings I had on those countless Friday and Saturday evenings on the road last decade. It is usually about what lies ahead. Sometimes life can get frustrating. When life does get frustrating, it is the promise of some kind of new experience that can help alleviate the feeling of melancholy that attempts to infect your mind. It is impossible to know what kind of storms you are going to see when storm chasing. Anyone that says they only want to go storm chasing if they know they will see a tornado simply does not understand storm chasing and should not be invited on future chases. The unknown needs to be embraced. It is the same with traveling to a place you have never been to before, trying something you have never done before, or meeting someone new. The place may be a disappointment, like when I was 8 years old and I thought Plymouth Rock would be bigger. You could always try a new activity or a new type of food and discover you don’t like it. And, we have all met assholes. But, the uncertainty is part of what makes it exciting. Any task where a certain outcome is guaranteed quickly becomes just another task, indistinguishable from work, chores, etc. This is why I gamble. This is why I go to parties and dance with complete strangers. This is why I am always looking to go somewhere I have never been to before. And, in a way, this is why I chase storms and study the weather. There is always a chance for a surprise, which makes these experiences the exact opposite of watching a movie you have already seen. I for one, cannot wait for my next journey into the unknown, regardless of what type of unknown it is. This entry was posted in Colorado, Nebraska, Storm Chasing and tagged Colorado, Funnel Clouds, Lake McConahey, Nebraska, Storm Chasing on May 25, 2013 by Stephen Jaye.